This particular building, owned by the aforementioned municipality, used to be a guest house for homeless people and later for migrants, run by a NGO of german interests. When the european funds had run out and this NGO had abandoned the migrants on their own luck, they kept staying illegitimately in the building until the municipality “wholeheartedly” decided to throw them out during winter in December ‘14. One year later, the building was squatted by anarchists in order to house political, social and other needs. The state of the building was terrible and was a health threat for the whole neighbourhood. The squatters have cleaned it in its total and renovated it, transforming it into a vivid space of self-organised political, personal and collective expression, far from the notions of market and capital, of authority and exploitation. In this space, besides the political assemblies, there are hosted diverse cultural self-expression groups, solidarity kitchen, a bookshop-library and a cafe-bar among others. Regarding the current eviction threat, the main actor behind it, is OKANA, one of the biggest NGOs in greece (having to do with drug addicts), with the pretext of creating a second chance school. Behind the humanitarian facade of this NGO, there are political interests hidden. The board of directors is consisted of members of the “leftist” ruling party (syriza), of the rightist opposition (nd) and the cops. It is neither the first nor the last time time that such a tactic is being utilized by the state in order to repress self-organised spaces of resistance and freedom, which stand as a barricade and create rifts in the destructive plans of state and capital, the plans of modern totalitarianism. We’ve heard this story many times before, when such pretexts were utilized in order for squats and spaces of struggle to get evicted, which since then, still stay abandoned, demolished or have become another useless mall. 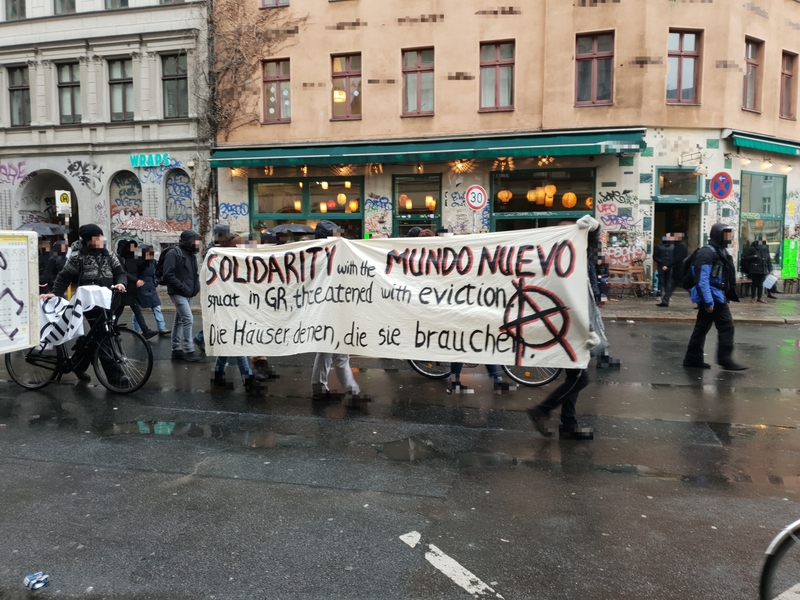 For these reasons and all the reasons in the whole world, we stand in solidarity with the anarchist squat Mundo Nuevo and against its planned eviction.